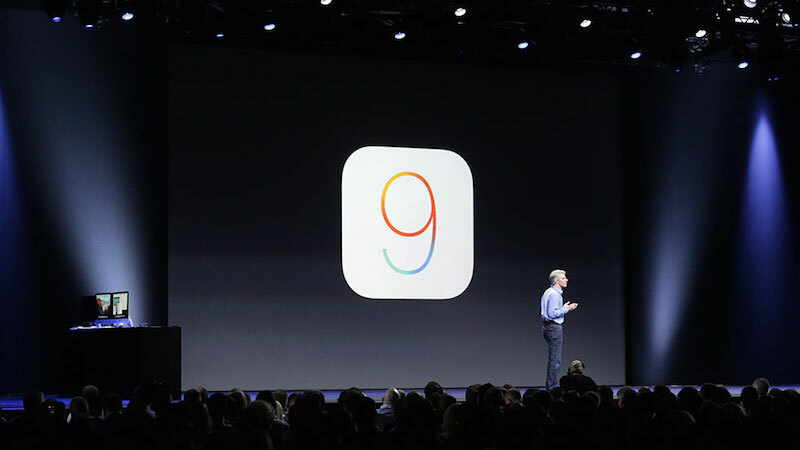 At today's WWDC keynote, Apple unveiled iOS 9, the latest version of its mobile operating system. iOS 9, which is designed to improve upon iOS 8, has four central areas of focus: intelligence, apps, iPad multitasking, and foundation. With iOS 9, our iOS devices are more intelligent and proactive thanks to improved Siri features and new deeper Spotlight search, and the iPad experience is better than ever with the addition of multitasking, letting users run two apps at once on the same screen. Built in apps like Notes and Maps have gained new features, there's a newly announced News app for reading news stories, and Passbook has been renamed to Wallet. Most importantly, performance improvements have eked out additional battery life, adding up to an hour in normal usage mode and up to three hours with a new power saving mode. iOS 9 will run on all devices that supported iOS 8. "iOS 9 is packed with more intelligence throughout, and delivers big updates to the apps customers use most — Maps supports public transit, a redesigned Notes app provides great new ways to capture ideas, and a beautiful News app delivers content that's personalized to your interests," said Craig Federighi, Apple's senior vice president of Software Engineering. "With our new iPad features, users can take advantage of the power of iPad, working in two apps at the same time with Split View, Slide Over or Picture-in-Picture." The new, more proactive Siri is contextually aware and can offer you more information than ever. For instance, if a user runs every morning Siri can offer music to listen to when the user plugs in their headphones. The music is context sensitive and is dependent on time and place, so if a user is in the car Siri may offer an audiobook or podcast instead of music if that's what the user usually does. If someone calls a user with a number not in their address book, Siri can now look through email to see if it can identify the number. If it can, it'll display it. iOS 9 has also been updated with a brand new Search window, which offers commonly used apps or contacts, one-tap links to nearby locations and breaking news. There's also a brand new API for Search, which means that it can now pull up content from within apps. When you tap on the information, you're deep linked into the app. This new search feature is accessed by swiping left on the home screen. With the new Search and Siri features, Apple placed a heavy emphasis on privacy. All features are anonymous and are not linked to an Apple ID, with users in control of data and content. When it comes to apps, both Maps and Notes are getting major updates. Notes includes new formatting options, checklists, and sketching tools, along with the ability to share notes from Share Sheets. Maps is gaining Transit directions and a new transit view that shows off the transit lines in a city, from buses to trains to subways. The transit options are integrated into directions, allowing users to get step-by-step directions in between transit stops. Siri is also integrated into Transit, so users can ask Siri how to get to a location via a transit option. Transit is coming to a limited number of cities, including many in China. Apple also announced a brand new, Flipboard-like app called News. The app, like Flipboard, takes content from sources like ESPN, Politico, the New York Times, Conde Nast publications and local news and presents them with rich typography and beautiful imagery. Users can also keep track of specific topics they like to read about. The new app will roll out to the United States, United Kingdom and Australia. The iPad is getting some exclusive updates in iOS 9, including multitasking and a brand-new QuickType keyboard. Users can now bring in apps on the side of the screen in a new feature called "SlideOver," which brings in windowed versions of apps like Notes, Mail and Messages with a quick gesture. Multitasking also allows users to put two apps next to each other with SplitView. Additionally, there's also a picture-in-picture feature that allows you to keep watching video from another app while you do something else, like check email. While most features are available for all iPads, SplitView is only available for iPad Air 2. Performance and battery life have been improved in iOS 9, with a brand new Low Power mode that can extend battery life for 3 hours. The Cupertino company has also updated its Software Update feature, improving the time it takes to download its latest software updates. Additionally, Apple has reduced the free space needed to download iOS 9, from 4.6 GB to 1.3 GB. Apple announced an update to Apple Pay, bringing loyalty cards and store credit and debit cards to the payment service. Kohl's, JCPenney and BJ's are some of the early store credit and debit cards that'll be accepted. CarPlay also got an upgrade in iOS 9, as it now supports apps by automakers that control things in the car. It also supports more kinds of car screens, including HiDPI screens. Finally, CarPlay is now wireless, allowing users to keep their phones in their pockets while in the car. For developers, iOS 9's various kits have also seen improvements in the new software. GameplayKit has AI and pathfinding while ReplayKit allows users to to record their gameplay and share it, much like users can do on the Xbox One and PlayStation 4. HealthKit has gained new health metrics. And finally, HomeKit has support for Window Shades, CO censors, motion sensors and security systems. Users will also be able to remotely and securely access their home from iCloud. Apple also announced Swift 2, an upgrade to its programming language, and made Swift open source. iOS 9, which is a free update, is available to registered developers immediately, and it will be available to public beta testers beginning in July. A public release will come in the fall. Make sure to check out our newly created iOS 9 forum, which we've added for users to discuss the new features and changes coming with iOS 9. It'll be a great resource for details on the new operating system ahead of its fall launch. Another worthless app icon incoming to my crap folder. It seems really easy to exploit Siri's ability to create reminders from emails without notifying the user. Spam messages (that pass the filter) could contain things like, "Buy ViaMax enhancement at 7:00, Buy ViaMax enhancement at 7:01, Buy ViaMax enhancement at 7:02, etc." Hell, friends could really mess with each other. Time to get better friends, then? "iOS 8 is terrible, Apple needs to focus on stability!!" "iOS 9 is boring, Apple needs to focus on features!!" It's hard to have it both ways, Internet. This is clearly an under-the-hood update. I suspect iOS 9 will be smooth as butter and get Apple's reputation back online. Apple needed to refine the OS for stability, speed, security, and user experience. I believe this iOS update will be widely praised across the tech industry. It doesn't have many presents...but Apple needed to focus on overall user experience and fluidity...I believe that is what they are accomplishing this year. Sadly most of these people will never be happy. They can add every feature imaginable and they will still complain that it's not good enough. Keyboard's shift key finally fixed!!!!!!! Hallelujah!!!!! !